Set of 7 Lacrosse Logo Pylons. Logo Pylons dress the lacrosse field with the school or club logo! 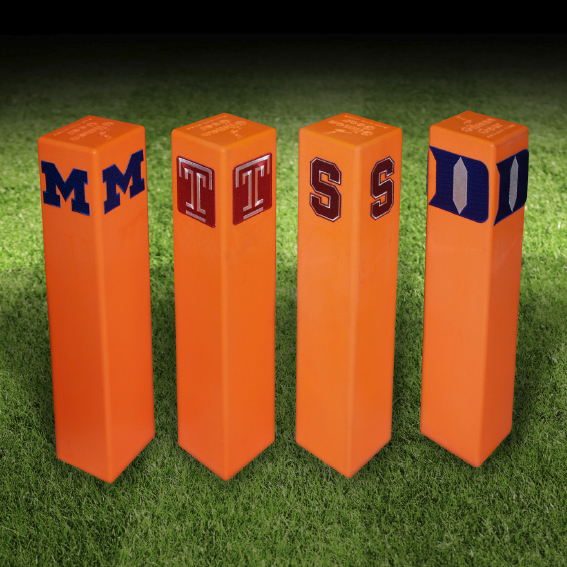 Branding the pylons creates a home field advantage, and an exposure opportunity for your school or club! Broadcast media and game day photographers capture the logo in screen shots or photos of the field. Each face displays an embroidered patch that stands out and has high visibility. Each set consists of 7 Pylons: 4 for the corners of the field, 1 on the center line on the opposite side of the substitution box and 2 on the substitution box. Logo must be submitted in a digital format, vector art preferred. Please call Gilman Gear at 800-243-0398 to inquire about purchasing.